Steven Gerrard has called on protection from officials for his Rangers players. 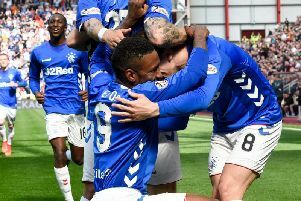 It follows comments made by the Steelmen's captain Peter Hartley who said it was “fun to watch” the weeping from Rangers have former centre-back had his nose broken by Ryan Bowman's elbow when the side's met in the semi-finals of the Betfred Cup last season. Gerrard says he is ready to forgive Hartley for his “naive” comments mocking former Rangers defender Fabio Cardoso. The defender issued an apology the same day for his comments. The Rangers boss, however, said his side will be ready to deal with the physical aspect of the opposition as long as referees give the proper protection. “If teams want to come to try and rough us up and bully us we’re game, we’re up for it,” he said. “Bring it on. It’s no problem. “We can’t control other team’s tactics and gameplans. If that’s their style then we embrace it and will deal with it. All we ask is the referee gives us the protection that we need, for both teams.